Jamie Vandersea joined MCOP in 2015 as a prosthetist/orthotist based out of our Silver Spring headquarters. At MCOP, Jamie is focused on providing his patients with advanced lower limb prosthetic care and the latest prosthetic technologies. Jamie first came across the Orthotics and Prosthetics industry as a student in upstate NY. After spending a few years as a technician and orthotics assistant, Jamie decided to follow his passion for prosthetics and transferred to NYU to pursue a degree in Orthotics & Prosthetics. 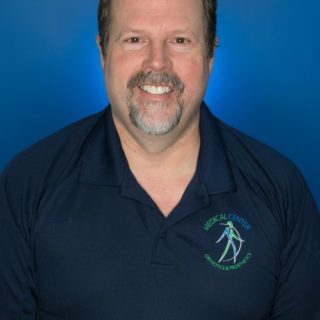 Since becoming a prosthetist over 20 years ago, Jamie has worked in various upper and lower extremity prosthetics roles all over the United States, including New York City, Southern California, and Maine prior to moving to the DC area. Most recently, Jamie worked as an upper extremity specialist at Walter Reed Army Medical Center. Jamie currently lives in Montgomery County, MD with his wife and two boys. When he’s not pursuing his passion for prosthetics, he enjoys fishing, boating, downhill skiing and home improvement projects. Professionally, Jamie holds the designation of CPO and is a member of the American Academy of Orthotics and Prosthetics.